While both discoveries are consistent with the existence of past or present life, they are alone not proof since both the organic molecules and methane gas production can be explained by alternative, non-biological processes. However, they have excited scientists who are seeking more data to determine the habitability of Mars. Among those planned missions is Mars sample return, a multi-mission architecture that involves collecting samples of Martian rock and regolith and caching them for collection by a later mission. That mission would then launch the samples into Martian orbit where a spacecraft would retrieve them and send them to Earth. NASA’s Mars 2020 rover will carry out the first phase of that effort by caching samples. Future steps remain undefined, although the agency’s leadership says that Mars sample return remains a priority. 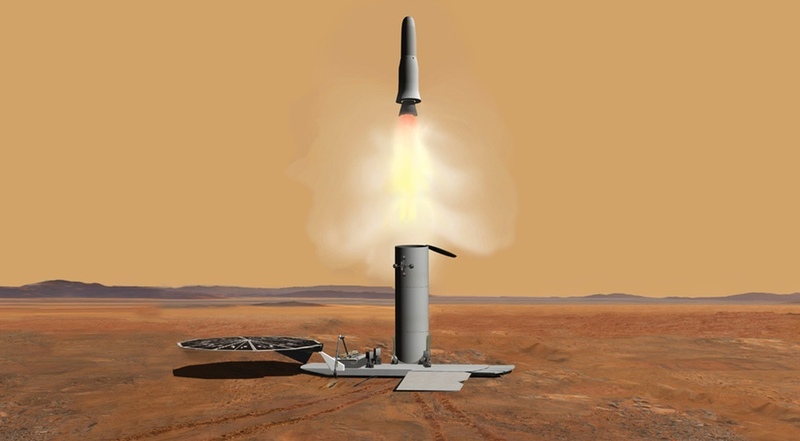 In August 2017, Zurbuchen unveiled a concept for “lean” Mars sample return that minimized the amount of infrastructure needed for returning samples from Mars, such as additional orbiters that provided communications or reconnaissance services. It would also reduce the scientific instrumentation on the rover that picked up the cached samples and the spacecraft that collected the samples in orbit for return to Earth. The goal is to return samples to Earth by the late 2020s. That basic concept remains under study, Zurbuchen said at a June 8 Space Transportation Association luncheon here. “Nobody has set the architecture,” he said. “What we’re doing is looking at a variety of options” that include participation by both international and commercial partners. Both Bridenstine and Zurbuchen emphasized the importance of Mars sample return in that it can provide scientists hand-on access to samples that can be analyzed in laboratories far more sophisticated than can be included on any spacecraft to help determine if Mars had, or has, life.